Bold, beautiful and bright, honestly, I can’t think of a another print I like quite as much as I do houndstooth. Perfect print to wear for fall and winter, I particularly love the graphic statement it creates but also the way it pairs with bright colors. Though normally I stay away from brights come Fall, something about black/white/bright color combo feels season appropriate yet allows me to inject a bit of color into my fall/winter wardrobe. Lately, the bright I’ve been playing with a lot is happy, sunny yellow ( last time seen here ). 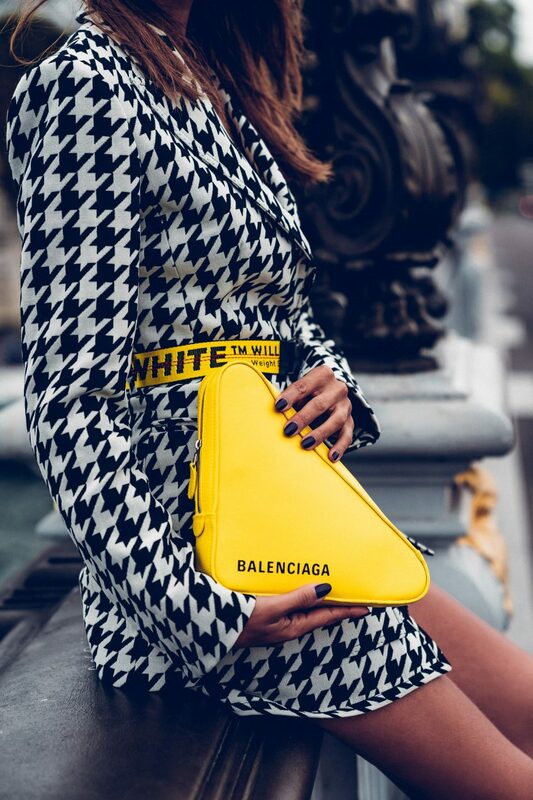 Aside from the fact that black, white, yellow color combo never fails to make a statement, I love the fact although this pairing definitely feels bold, there is a certain kind of polished sophistication about it. Basically, no matter how you wear it ( dressy, casual or something in between ) you will always look polished and pulled together. Love that! Clever belt – love this outfit! I love ♥️this pattern houndstooth are always a classy and sophisticated look … simply chic and mode as always! In loveeee with this Off-White look! Love how you styled this! Gorgeous coat and I love how you contrasted it with the yellow. 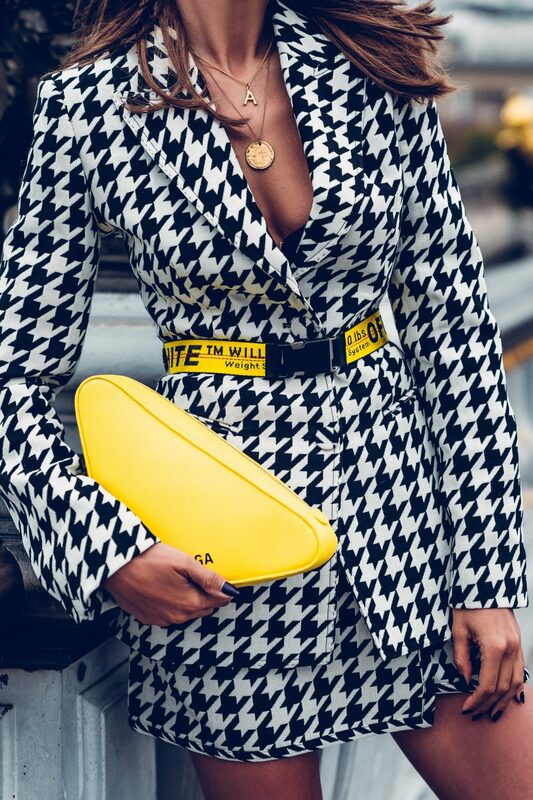 I need to get my hands on some houndstooth printed pieces! everything is ON POINT! Love it! Thank you for sharing such a nice blog, very informative and helpful keep sharing. I am loving houndstooth print for the Fall! 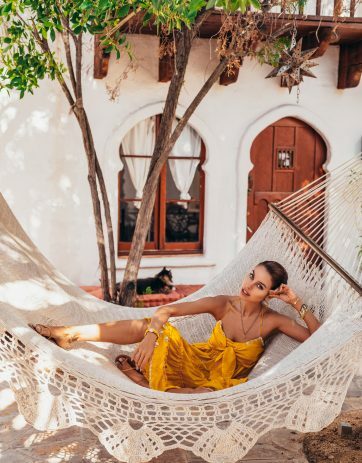 I just added a few pieces to my wardrobe recently and cant wait to style them after seeing this post <3 Looking beautiful as always, Annabelle! I too love this classic pattern and certainly love your modern twist . 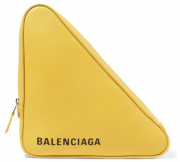 I love the Balenciaga bag ! Need to keep an eye on someone or something; recover lost passwords etc; visit:- [hackerlounge . net] through your browsers url box; Best viewed on a desktop or through your PC. They are the real deal for all your spy activities. those are gorgeous photos. what a beautiful view. Very beautiful combination. I love your style. You always manage to create very beautiful looks with a high sense of style and elegance. Also, I want to compliment your photographer, your pictures are very professional and beautiful.